The 2nd generation AhQ Go currently supports more features! AhQ Go integrates 4 engines including LeelaZero[30K-9D], AQ[5D-8D], Ray[10K-5K], Pachi[18K-10K] that have different difficulty levels. The highest level of LeelaZero engine has achieved 9d in FoxGo rating! You can choose engines of different difficulty according to your own level, then fine tune the level of AI by setting the time and other parameters. Future versions will also be updated in this post. Ah Q Go 2.3.2 has been released! Ah Q Go 2.4.0 has been released! Ah Q Go 2.4.2 has been released! According to the authors of Ms5, Ms5 is somewhat different from other weights and may have compatibility problems. So I don't know why. 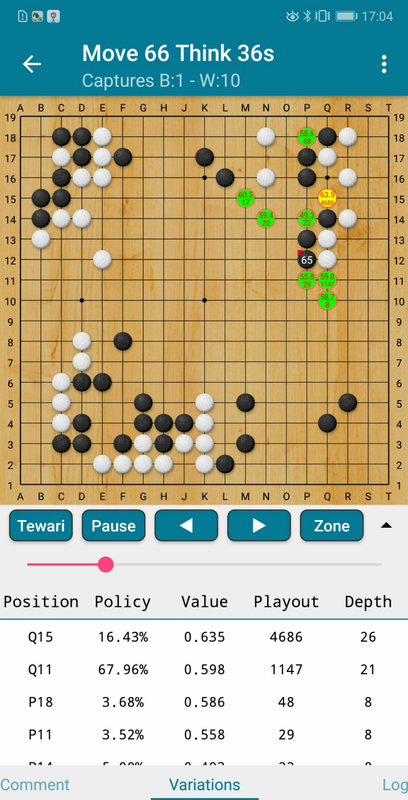 Ah Q Go 2.4.6 has been released! Ah Q Go 2.4.7 has been released! Ah Q Go 2.4.9 has been released! 1.Optimize Hawk-eye's slips. Now it's more accurate.